The Modify Coded Segments section has already described how you can move or copy individual coded segments. If you move a code from one position in the “Code System” to another, the code references move automatically together with the code. This is like moving a drawer from one place to another in a cabinet; the drawer’s contents move together. To move a complete drawer is something other than to move only its contents. The same is true with code references. If you only want to move the code references to another code, you cannot use the procedure described above. There is another procedure that leaves the drawer in its place and merely shifts its contents. In MAXQDA, it is the Move coded segments option that does this job. This option is available in the context menu of the particular code from which code references are to be moved. Right-click on Code A (the target code) and choose Move coded segments from ‘Code B.’ MAXQDA asks you to confirm the command before executing it. Code B remains in the “Code System” until you delete it, but the number of its immediate code references is now zero. The contents of the “drawer” have been moved to Code A. The subcodes’ references, however, will not have been moved. Be careful when deleting Code B now, since all subcodes – if there are any – will be deleted too, along with their code references. The outer segment boundaries of both encodings are retained. Thus, if a segment with “Code B” is from word 1 to 5 and the words 4 to 10 have already been coded with the target code “A”, the new segment ranges from word 1 to 10. If both coded segments have a comment, the comment on the target code is retained. The comment on the moved code is deleted. If only one of the two coded segments has a comment, this comment is preserved. The coding weights of the target code “A” are retained, regardless of the coding weight of the shifted code. If several existing segments of the target code “A” are combined into one large coded segments because they all lie in the segment boundaries of a “B” coded segment, then this large segment receives the weight of the oldest “A” coded segment. Only the comment of the oldest coded segment of “Code A” will be taken, all other comments of code will be deleted, even if the oldest coding has no comment. If none of the existing coded segments has a comment, the comment is taken from “B”. Because of overlapping coded segments, the number of coded segments of the target code after you shifted codes can, of course, be smaller. If you move 10 coded segments from “Code B” to “Code A” with 20 coded segments and several segments overlap, you will not see 30 but fewer segments under “Code A”. The function “Copy coded segments” is similar to the “Moving all coded segments of a code” function. The important difference is that the original code assignment will be retained; that is to say, the coded segment will be duplicated and assigned to a new code in addition to the original code. 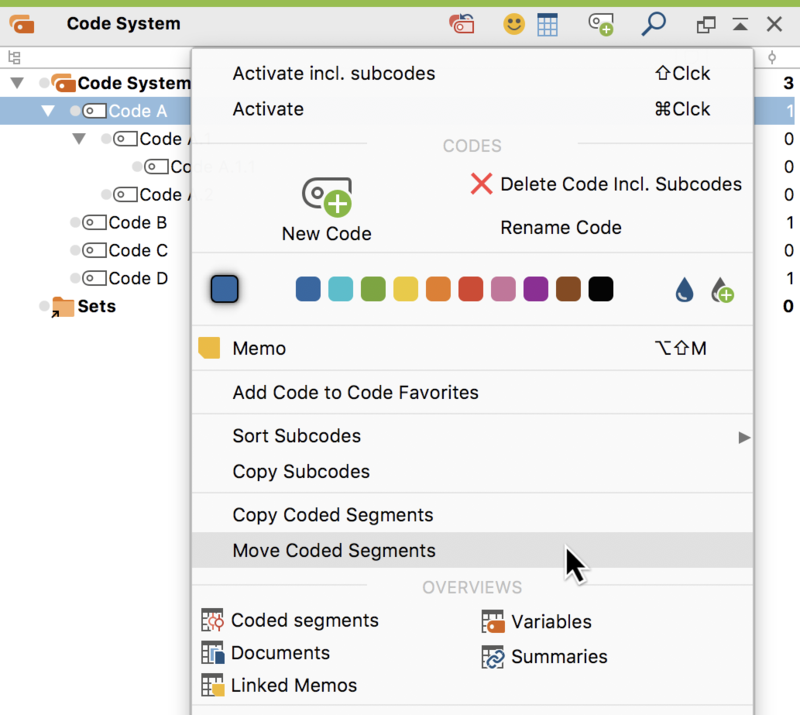 Right-click on the selected code in the “Code System”. 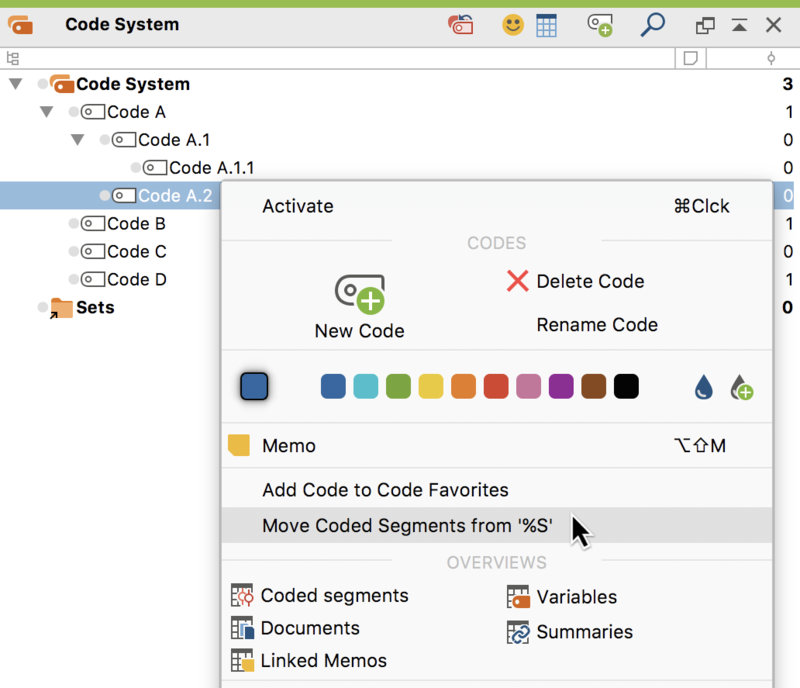 Select Copy coded segments from the context menu that appears. Move the cursor to the target code to which you want to copy the coding added and click on it with the right mouse button.